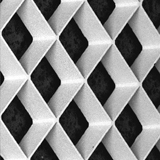 X-ray Anti-Scatter Grids - Creatv's patented cellular grid design, combined with proprietary fabrication methods, significantly increases transmission of the primary radiation while reducing scattered radiation, enhancing image contrast and readability. Collimators - Creatv makes customized, high-resolution collimators for gamma-ray imaging in pinhole, parallel-hole, fan-beam and cone-beam formats. 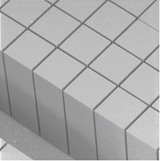 Creatv's precision grids and collimators improve the clarity, resolution, and contrast of x-ray and nuclear imaging. SEM of PMMA mold 25 micron septa, 550 micron period and 1.8 mm thick. 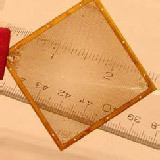 Photograph of 1.8 mm thick gold anti-scatter grid with 25 micron septa and 400 micron periodicity. SEM of 0.5 mm thick tungsten powder composite structure with 40 micron septa and 350 micron periodicity. 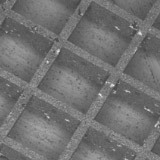 SEM of a 2.8 mm thick copper x-ray antiscatter grid with 25 micron septa (aspect ratio of 112) and 550 micron periodicity. 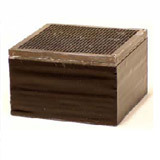 Photograph of a lead collimator 2.0 cm tall with 130 micron septa and 1020 micron periodicity. Creatv produces custom products to specifications, while also performing design and simulation services.